The seminar, held on October 17, was attended by about 200 people, including relevant stakeholders in the financial sector, the sphere of investments and the pension funds, as well as regulatory authorities. 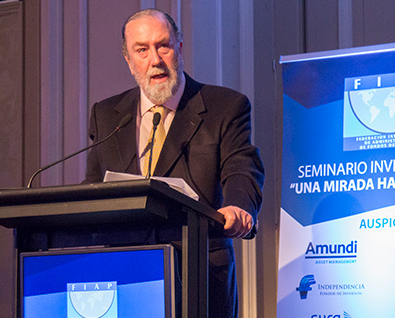 At the inauguration, FIAP’s President, Guillermo Arthur, emphasized the fact that the professionalism, technical capability and experience of the investment teams of the AFPs, dedicated to investing in the new class of alternative assets, will enable increasing the returns of the pension funds, which, together with an increase in the contribution rate, should result in an improvement in the pensions of workers. In the first panel, renowned speakers discussed the challenges involved in investing in the different alternative assets, presenting possible solutions for boosting investment in these types of instruments. The second panel, on the other hand, analyzed the new trends in investment portfolio management (Smart beta and investment in risk factors, artificial intelligence and responsible investment). At the end of the seminar, the Chilean Superintendent of Pensions, Osvaldo Macías, referred to expected future challenges and the actions taken by the Pensions Commission and the AFPs for the proper implementation of alternative asset investment. Download the presentations here (only the Spanish version).